An old trumpet sat neglected in the closet for years, but when Alex Rodriguez was 10 and in the fifth grade, his dad extracted it and gave it to him. With the opening of that closet door, Rodriguez followed through on a casual decision to sign up for a music class at Ainsworth Elementary School. The horn sounded a beginning to a passion, musical friendships and a joyful and intriguing profession. While at West Sylvan Middle School, Rodriguez had dental braces, so he switched to the more comfortable euphonium with its bigger mouthpiece. The brass instrument is baritone-voiced and has a valve like the trumpet, but the tone is mellower; its name comes from a Greek word that literally means "sweet-voiced." Later in middle school, Rodriguez switched instruments again, this time to the trombone. He liked the way the slide bent notes and led him deeper into jazz, and he began taking weekly lessons from Southwest Portland musicians Ben and Michelle Medler. 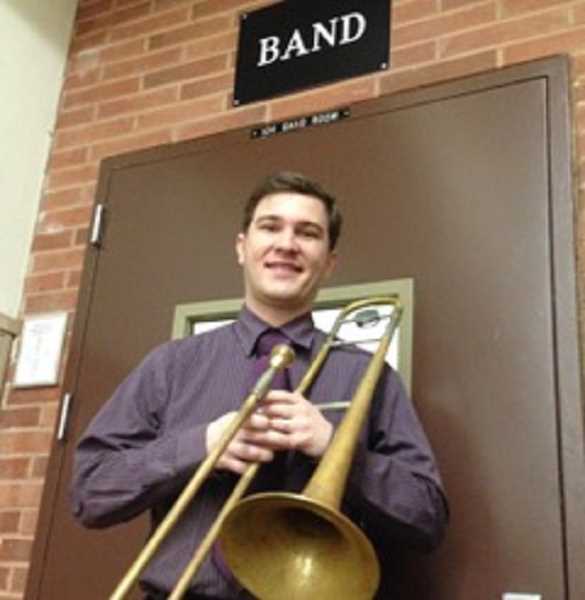 Ben, who was directing Wilson High School's jazz band at the time, saw middle-schooler Rodriguez progressing at a tempo more in step with the high school jazz band, so he invited Alex to sit in. More than that, Rodriguez jokes, "They needed a good trombone player." More than learning his instrument from the Medlers, Rodriguez says, he learned about "loyalty — loyalty to the music." Today, at age 32, Rodriguez is beyond loyal; he's immersed in the music. He says jazz, for him, is music that "makes the heart tremble." Rodriguez still frequently sees the Medlers. Ben left Wilson in 2001 and in the same year founded The Portland Youth Jazz Orchestra. Today, the couple co-directs PYJO, which rehearses and jams at a storefront on Southwest Terwilliger Boulevard just across from the Market of Choice in the South Burlingame neighborhood. After Medler left Wilson, Rodriguez in his final two years at the school found an outlet for other talents on the Wilson speech and debate team. Alex Rodriguez is no one-trick pony. But after he graduated from Wilson in 2003, music — and the study of it — returned as his core passion. At Amherst College in Massachusetts, Rodriguez earned his bachelor's in music. Then it was on to Rutgers University in New Jersey, where he received his master's in jazz history and research. His thesis was titled "White and Blue: Alternate Takes on Jack Teagarden." Teagarden's playing, like that of other jazz legends, becomes infectious across cultures. And each culture adds to the music. But how? That's a question that Rodrigues became immersed in answering, starting on the West Coast. He now is pursuing his Ph.D. in ethnomusicology at UCLA. The title of his dissertation, now in the works, is "Making Jazz Space: Clubs and Creative Music Practice in California, Chile and Siberia." And yes, he as been part of the jazz scene in those far-flung venues. He was in Chile from September 2015 to May 2016 and in Siberia in the fall of last year. He has taught brass and served as creative director of the Santa Monica Youth Orchestra and was the assistant director of the UCLA Jazz Orchestra. His talents have also extended into writing. In 2014, he was editor-in-chief for the open-access academic journal Ethnomusicology Review. His writing has also been in newspapers and on the web. (Yes, he has a website: https://lubricity.wordpress.com.) He has written for jazz.com's Encyclopedia of Jazz Musicians. NPR Music has published his reviews. To give you a taste of where music and culture connect, consider Rodriguez's blog entry comparing jazz and basketball. For starters, think "improvisation." Rodriguez is now living in Northeast Portland and plans to stay there at least a year, writing his dissertation. But given how far music has taken him, it's hard to imagine him staying put for long. That long-neglected trumpet started a story with no end in sight. As Alex puts it, "Music gave me the gift of being connected to the world."